Cactus Gallery is a vibrant Latina owned and operated gallery and gift shop. Our space is an eclectic mix of contemporary art and folk art. 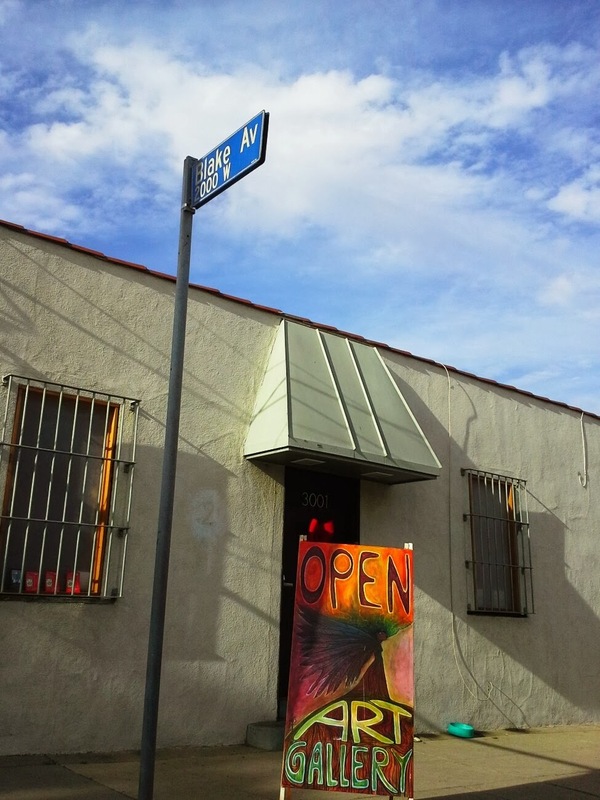 Find us in Elysian Valley (aka Frogtown) at 3001 North Coolidge Avenue, Los Angeles, CA 90039. Hours: Thurs-Sat 11a-5p. Art is available to browse 6 days a week, as Treeline Woodworks is open Mon-Sat 9a-4p. The gallery is open to installment plans to help you grow your collection. Contact Sandra Mastroianni at semastroianni70@yahoo.com for purchase info. 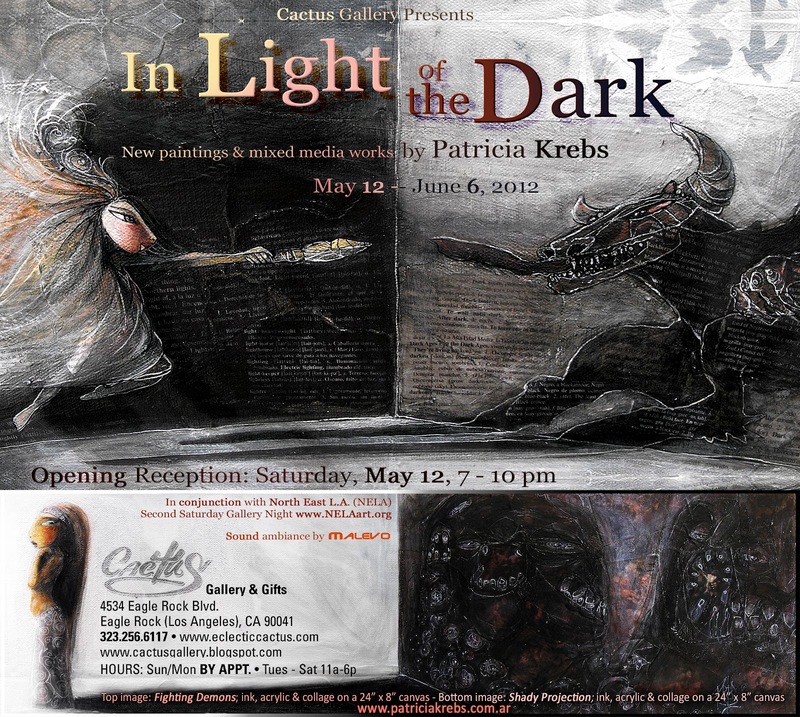 Cactus Gallery is proud to present "In Light of the Dark," a solo exhibition by multimedia artist Patricia Krebs. In her work, Krebs talks about life: the complexity of humanity, the connections within ourselves, between each other, and to the Earth. 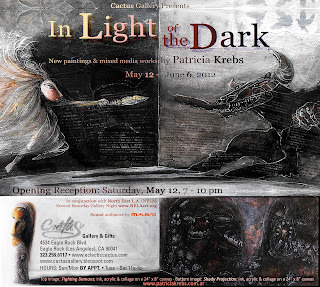 For “In Light of the Dark” – her fifth annual solo show at Cactus Gallery - Krebs presents a series of mixed media pieces primarily created with collage, ink and acrylic on canvas. Krebs then playfully combines gestural painting and line drawing, incorporates detailed photos, small pieces of text and adds three dimensional objects. Through the visual elements and the narrative, these new works reflect on how polar opposites, or seemingly contrary forces, are interconnected and feed each other. She depicts how what we see as contraries or contradictions (dark and light, feminine and masculine, good and bad, life and death, etc.) are all part of a universal balance, often times exploited by humans’ own need for strict classifications that lead us to prejudice. Her whimsical characters seduce us and call us to pay close attention to have a better perception of what is shown and what is hidden. Patricia Krebs (1976) grew up in Buenos Aires, Argentina, where she earned her degrees in Fine Arts and Contemporary Visual Arts. Since 2001, she has lived in Los Angeles, California, where she works as a full-time multimedia artist. Krebs’ artwork has been exhibited in galleries and cultural centers, and featured on books covers, CDs and educational magazines in South and North America. She has designed and illustrated over a dozen books, including several award winning children’s picture books, and created puppets, props and masks for theatrical events. In addition, she has written lyrics & music for her own musical projects as well as for other artists and companies, and recorded Spanish voiceovers for major movies, such as Corpse Bride, Harry Potter and the Goblet of Fire, Beowulf, and Happy Feet I & II. Some highlights in her career include: Women Artists On Immigration exhibition at the Korean Cultural Center of Los Angeles, selected by MOCA curator Alma Ruiz (2008); illustrating for Decisio Magazine, published by the Center of Regional Cooperation for the Education of Adults in Latin America and the Caribbean, CREFAL, sponsored by UNESCO; being selected for the Mayor’s Official Invitation to the LHM Opening Celebration (2009), for which she received a Certificate of Special Recognition “in appreciation of outstanding and invaluable artistic contribution to the City of Los Angeles 2009 Latino Heritage Month” (2010); and, the book Classic Songs, Rhymes, and Activities in English, Spanish and ASL, which Krebs illustrated and helped translate into Spanish, being selected for the Outstanding Books for Young People with Disabilities Collection by IBBY (the International Board on Books for Young People) presented at the Biennial International Children’s Book Fair in Bologna, Italy (2011). Cactus Gallery is pleased to extend its "Dollmakers" exhibit through May 5th. We are very happy with all the doll adoptions and would like to find more homes for the other art dolls. 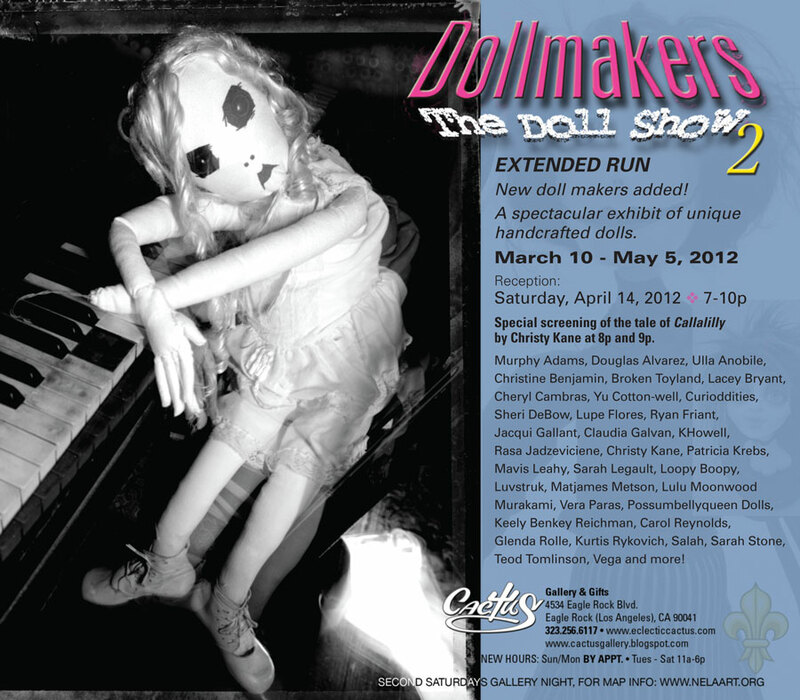 We will be featuring a few new doll artists, new dolls, and a special screening of the tale of "Callalilly" by Miss Christy Kane at 8pm and 9pm. A few of Kane's books and photographs are still available. If you have a question regarding availability of work, please contact Sandra @ semastroianni70@yahoo.com or 323.256.6117. Adopt a doll before May 5th! Check out this short whirl of a video to see some REAL dolls and art dolls! Long enchanted with the whimsical side of traditional fairy tales, artist and storyteller Christy Kane creates life size, one-of-a-kind, handmade dolls then photographs them in antique settings to illustrate her original stories. Her dolls have remarkably distinct personalities, her photographs are nuanced and richly detailed, and her stories are haunting and unforgettable. Her first book "Tales of the Sisters Kane" is now available. With the help of the Chiodo Bros. (Killer Klowns from Outer Space, Vincent, Team America) she created a live puppetry version of her tale "Callalilly" which won runner up for Most Visually Innovative Short Film at the 2008 Baltimore Women's Film Festival. She is currently working on "Tales of the Sisters Kane Book II" and her next short film. With the help of her dolls, she runs a blog about their lives.